Here's mine! It was great meeting you Dave and seeing Beth again. When should be plan the Fisherman's Terminal sketch outing? UPDATE: Guy Quintino, the bassist from the Past Duo just emailed me a cut from their new CD with "You're Gonna Miss Me," one of the pieces they were performing while we sketched. They also run a jam in Ballard at Conor Byrne the first Wednesdays of every month. Enjoy! You always get the feel just right! I especially love the guy selling apples, with the backwards hat! I have to second that. This really captures the attitude of that little slice of the market. The postures of the two are perfect - the guitarist coiled and intense, the bass player upright and head turned aloofly to the left. I can get together tomorrow morning for Fisherman's Terminal - a few hours starting at 9. That may be too short notice to get everyone together though. We could do it in the evening during the week too. I have a friend that repairs fishing boats down there that works in the evenings. He may make a good subject and can give us some interesting insights. If planned in advance I can do Fishermen's Terminal almost anytime (except June 18th or 20th). I figure all you fathers will be busy on Fathers' Day! Looks like you all had loads of fun at the Farmers' Market! 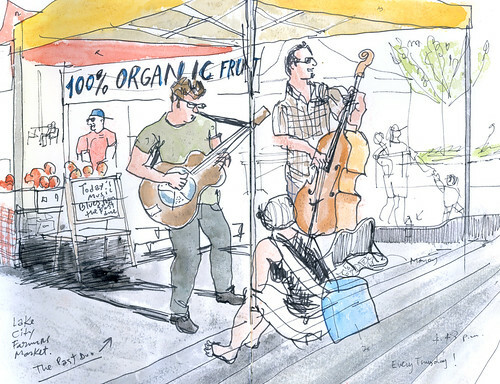 I hope to sketch during the market too on the 18th. I'm interested in going to the Fisherman's Terminal too, but can't until the week of the 22nd. I have lots of open dates on my calendar beginning that week. I suspect there will be more than one trip to that neat location! !